What is a Scup ? The scup (Stenotomus chrysops) is a fish which occurs primarily in the Atlantic from Massachusetts to South Carolina. Along with many other fish of the family Sparaide it is also commonly known as porgy. 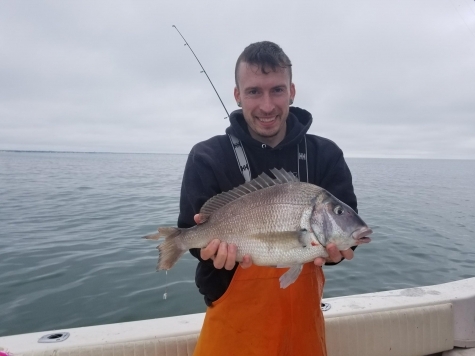 In the Middle Atlantic Bite, scup spawn along the inner continental shelf. Their larvae end up in inshore waters, along the coast and in estuaries areas. At two to three years of age, they mature. Scup winter along the mid and outer continental shelf. When the temperature warms in the spring, they migrate inshore. They are fished for by both commercial and recreational fishermen. The scup fishery is one of the oldest in the United States, with records dating back to 1800. Scup was the most abundant fish in Colonial Times, landing the name "porgy," which was the American Indian for "fertilizer. 2. Get some squid from a local tackle shop. Cut squid mantle (meaty casing) into strips, 3 x 3/4 inches. 3. Thread hook three times through squid strip. 4. From boat: send bait to ocean bottom. Jig bait slowly up and down off bottom. From shore: cast out and let bait sink to bottom. Reel in until line is taught. 5. Wait for the scup to strike, which often feels like a tap, tap, tap at the end of the line. 6. Set the hook and reel in your supper. 1. Prepare 3 wide shallow bowls with flour, egg, and panko breadcrumbs. Line a sheet pan with foil or parchment paper. Season fish with salt and pepper. Dip each piece into the flour, then egg, and then breadcrumbs. Press breadcrumbs lightly onto both sides. 2. Heat your largest, thickest skillet on medium or medium high and when hot, add about 2 tablespoons of butter and olive oil. Fill the pan with the fish, and cook on one side until golden, 3 to 4 minutes depending on the fillet size, flip over and cook on the other side another 2 to 3 minutes. Check one piece. Serve immediately, with a wedge of lemon.